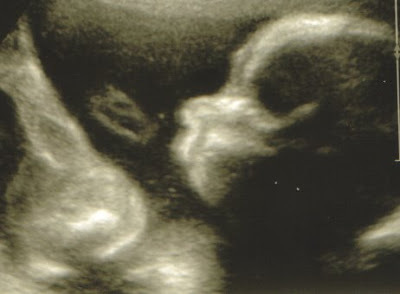 April's Little Family: This is What My 22 Week Fetus Looks Like. In Case You Were Curious. This is What My 22 Week Fetus Looks Like. In Case You Were Curious. S/he was moving and wiggling, so it's not a great face shot. Except that it is. Because it's my little guppy. p.s. Have you entered to win a Target gift card yet? You can enter up to four times every day!!! p.p.s. Ever wondered how to make that fantastic Curry Mustard Sauce from Pollo Tropical? very cute :) glad to see you're doing well. Awwww, that is one fine looking fetus! I hope you continue to feel well, and grow! What a cute little guppy! Yay, yay, yay!! And so cute already. It's always so exciting to get those ultrasound pictures and even when they look like an indescribable blur they are beautiful...right now mine only shows up as a little blurry blob...I can't wait for it to have a distingishable baby shape. :) And yes, your fetus is gorgeous! Sorry you are not happy about it ... but looks like you have a little lady coming as a super late bday present. How did I miss that you were pg again? I really haven't been on the ball! Congrats and beautiful fetus you have there! Aw, so cute!!! CONGRATS! 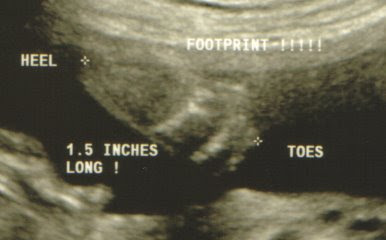 I can't believe you're already 22 weeks! Ok...you said to post everyday, so I am posting again that I would like to win! And I still follow you! the valuable ideas you provided do help our team's investigation for our company, appreaciate that.